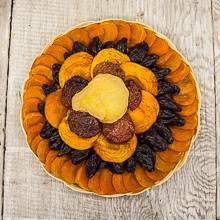 A colorful basket brimming with our succulent black French prunes, jumbo apricots, peaches, plums, and a pear. Guaranteed family favorite! Net wt. 2 lb. Ship wt. 3 lb.